This annual exhibition completes the artistic cycle taking that which is created behind closed doors out on display for the world to see, proving invaluable insight into the world, interests and concerns of all those whose works are laid out before us. This is also an acknowledgement of the creativity, vision and inspiration behind the art teachers and their ability to have their students articulate their thoughts and ideas. The Arts are an essential part of public education. From dance and music to theatre and the visual arts, the arts give children a unique means of expression, capturing their passions and emotions, and allowing them to explore new ideas, subject matter, and cultures. They bring us joy in every aspect of our lives. Arts education not only enhances students' understanding of the world around them, but it also broadens their perspective on traditional academics. The arts give us the creativity to express ourselves, while challenging our intellect. The arts integrate life and learning for all students and are integral in the development of the whole person. The Arts communicate and speak to us in ways that teach literacy and enhance our lives. We must continue to find a place for arts programs and partnerships not only for what it teaches students about art, but for what it teaches us all about the world we live in. This year I have asked each of the three teachers to provide some additional insight into their methodology, interest, concerns and the artist projects that have subsequently resulted over the past eight months. Brad Gibson the long serving art teacher at Princess Margaret Secondary School writes: “It is always special to watch a small child draw, cut and paste without the fears and inhibitions we seem to develop at certain points in our lives. I am always reminding my students that our skills and ideas evolve as we gain more exposure to the whole process of making art. It is imperative that we stumble and fail before we can actually feel a sense of accomplishment with the things that we make. 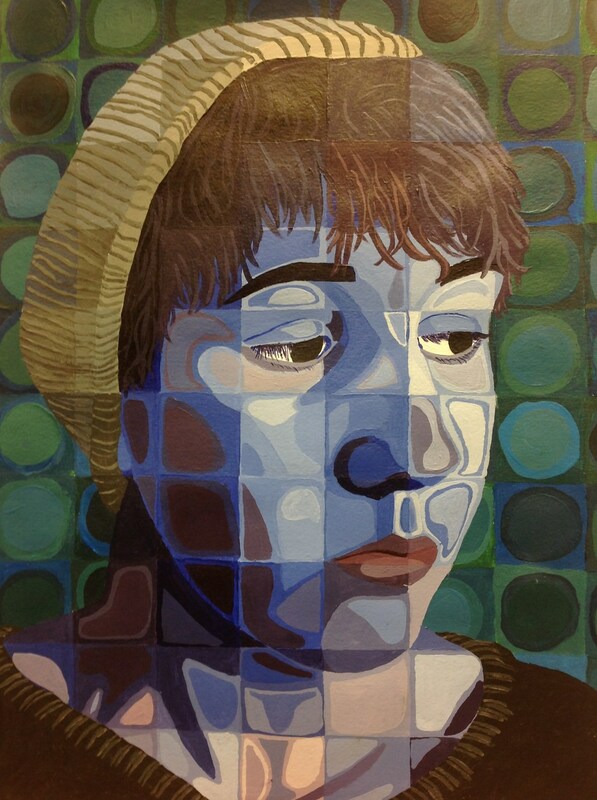 Princess Margaret Secondary School is pleased to be showcasing the works of students in grades 9 through 12 in this year’s student show. Our grade 9 and 10 students will be presenting a selection of handmade bobble head sculptures painted with acrylics and graphite portraits of a subject they chose from pop culture. The grade 11 and 12 students will be displaying charcoal self-portraits, small watercolor and ink works we called “Postcards from the Art Room”, a variety of images created using black scratchboard techniques and some of their recent clay lantern structures built using a variety of hand building strategies discussed in class. 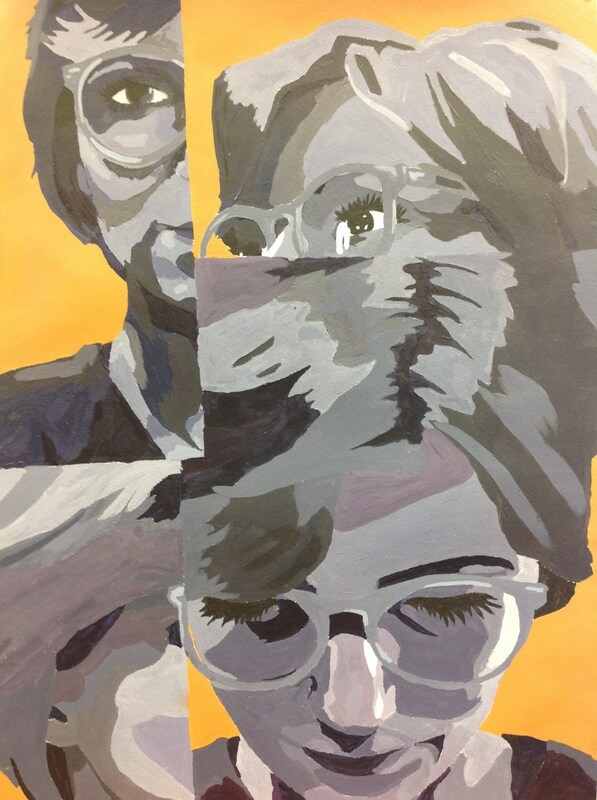 The newest addition to our team is Shauna Reid, art teacher at Penticton Secondary, who describes their projects and methodology as: “This year the Penticton Secondary Senior Studio Art students have been working on original image development. Taking one idea, molding and manipulating that composition to come up with new material. Students were given the task of drawing from nature. They chose between pine cones and deer sculls and created lovely detailed graphite studies of these objects. The next challenge was to create a contour line illustration of their drawing and then an abstracted chalk pastel composition of the same subject. 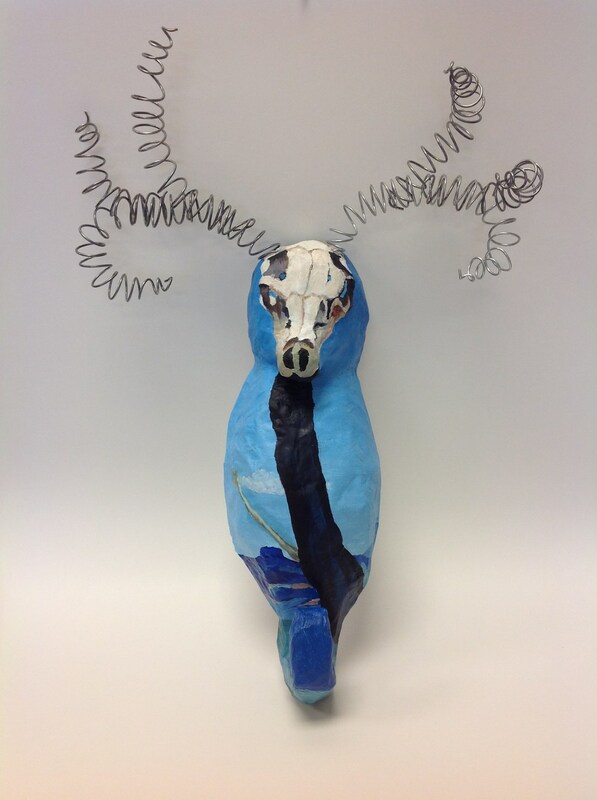 In keeping with the idea of line and contours the students created wire sculptures that they then had to evolve into a series using different mediums. The junior students looked to the Masters in Art History and to modern artists for inspiration. They have all studied an artist of their choice and then created a paper maché sea creature to cover with a replica of their chosen painting. Finally Donna Cowles of Summerland Secondary School describes the focus of her program as: Visual Art students taking 3D Design at Summerland Secondary have been excited to explore the evolutions of natural materials this season. Our focus for 2015 has been on reclaiming and restoring the beauty of clay to a workable and fine working stage. With buckets of dry, crusty clay pieces, students followed the natural process of adding water and working clay with their hands as in traditional methods used by ancient civilizations. Looking at ceremonial clay dance, students used their hands and arms to press, mush and churn watery mud into a smooth silky slip poured into a plaster bat and then handled into workable clay portions. These portions were later wedged and used for quick gestural studies to gain an understanding of exhaustion and break down of clay. A beautiful, natural and valuable evolutional process from earth to art. Thank you to each of the participating students for sharing with us an unique insight into your world and while a career in the visual arts may not be in the cards for you, I have no doubt that the lessons learnt over the past eight months will serve you all through-out your life in ways that may not be immediately noticeable, but upon reflection will become clearer. I wish you all the very best and I know you are richer for having had the good fortune to be mentored by these three inspired teachers, Brad Gibson, Shauna Reid and Donna Cowles. May you all have a safe and fun summer vacation and I hope to see you here in the gallery well into the future.